Chelle and Nelson in Charleston, September 2007. “A Sister, a Mom, a Family Prepares for Military Life” – Dorie Griggs. 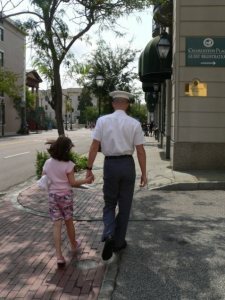 It’s hard to believe in just over a month my oldest son will graduate from The Citadel. The time, for me at least, has flown by. Looking through photos from his college career, I’m forced to believe the time really has gone by. Our daughter, Chelle, is the measuring stick. She was a little girl in 3rd grade when Nelson started his knob year (freshman). She is now a young lady in 6th grade and about 12 inches taller. The photos tell the story best. During the 2007-08 school year she always brought a treasured stuffed animal on our visits to The Citadel. Now she brings a book. 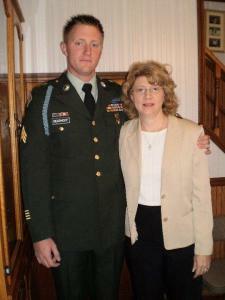 Dorie Griggs knew little of military life until her son joined ROTC in high school. That’s when her education began and has not stopped since. She’s cheered him through four years and graduation at the Citadel and watched as he made his First Jump at the U.S. Army Airborne School. Through her writing and photos by her husband Stanley Leary, Dorie has taken us along as she travels the unknown road as a military mom. Tracie Ciambotti and her son, Joshua Nearhoof, Army Sergeant out of Fort Carson, September 2010. “An Army Mom Connects Military Families and Churches” – Tracie Ciambotti. My son enlisted in the Army two days after graduating high school in June of 2005—five months later he was in Baghdad in the middle of a war. He received the best training in the world for his new job as an Army infantryman; I however, did not receive any information or training for my new role as the mother of a soldier. Families that have a loved one in the Armed Forces sacrifice and serve with their enlisted and they need support. I could not find one support group in the community or county where I lived in Pennsylvania at the time. Most communities in this country have support groups for all kinds of things; alcoholism and drug addictions; cancer and many other diseases; crime victims; and many more. When Tracie Ciambotti couldn’t find a support group for military moms and families near her Pennsylvania home, she co-founded Military Families Ministry. She has generously contributed to Off the Base – writing about her experience as an Army Mom detailing the emotions of deployment but also the drive to provide soldiers and their families prayer and support. 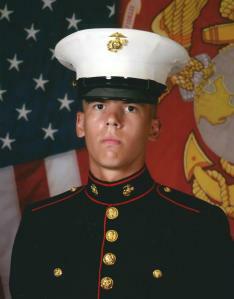 Jared Agle's official US Marine Corps photo. “A Marine Mom Lets Go a Week Early” – April Agle. … the Marines made their presence known in our lives. It became very clear that things were going to be different from now on. Jared called me at work on Thursday, August 5th. He had just received a call from his Marine recruiter that his departure date for boot camp had been moved up a week early to Sunday, August 9th. Jared was asked if he could leave a week early. As Jared said to me, “ I can’t say no mom. I need to call him back and tell him okay”. I was proud of myself. I told him to go ahead and call the Recruiter back and tell him that he would be ready to go. I hung up with Jared. My heart was pounding so fast. I was in a panic. My eyes teared up. I called Roger at work and told him. I hung up with Roger and cried a bit. I knew it was coming – I knew this day was coming. I thought to myself, “the stupid military is already messing with my plans”. I thought I was ready for this and was finding that it was not true. I knew I had to be strong. I remember thinking that it is only boot camp, it’s not like he is going to war – At least not yet. April Agle works in the business office at WUSF Public Broadcasting, where I work. She’s not only a colleague, she’s a friend. Her 17-year-old son, Jared, convinced her to sign the papers for the Marine Corps Delayed Enlistment Program while he was still in high school. I convinced April to write about the experience. 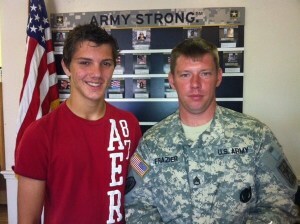 I also had the privilege of interviewing Jared before and after boot camp in 2010. He’s now serving in Afghanistan. 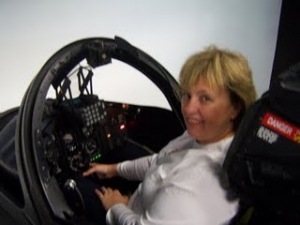 Momma B tries out a flight simulator - three of her children are aviators in military service. “A Mom, 4 Kids, 4 Services: Army, Navy, Air Force and Marines” – Momma B. My mom radar was definitely on the blink. As an aviator’s mom (make that triple aviator’s mom ) I scan the news daily for any mention of a mishap that might remotely involve my boys or any of their compadres. And when a news crawl or Google alert pops up I am on the phone, if possible, checking to make sure my kid is safely on the ground. Such is the life of a military pilot’s mom. It doesn’t matter if they are deployed or not. Every day, they do battle with physics. My Marine in his F/18 defies gravity and the speed of sound, flying way too close to another airplane to make a mom comfortable. My P/3 NFO is up for hours in OLD airplanes-thankfully soon to be replaced. And my Army ROTC cadet in helicopters-those things fly way too close to the ground, don’t you think? 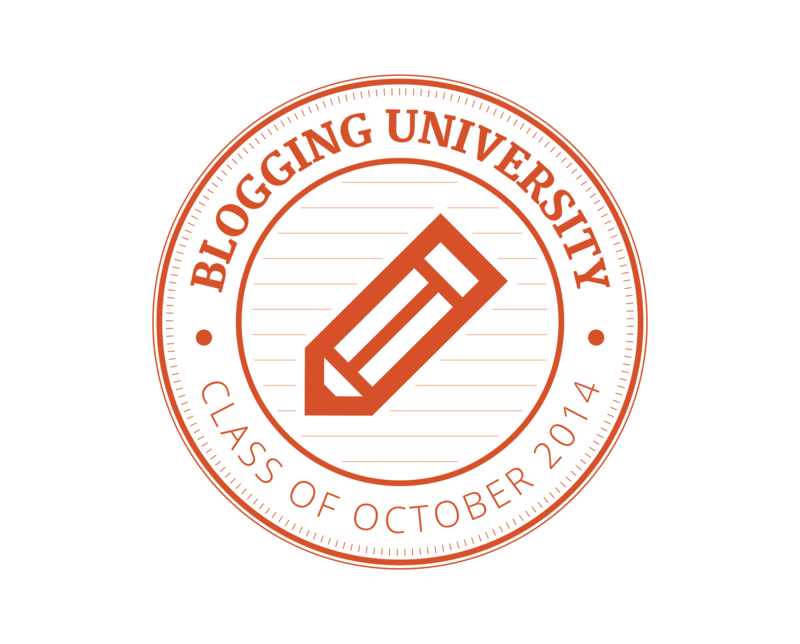 This Off the Base contributor goes by the nom de plume of Momma B on her blog: 4starmilitarymom. She’s mother to four children – all are in the military. Photo courtesy of Lynn Nankervis. “Seven Is Too Young to Join the Army” – Lynn Nankervis. Today I sat in an Army recruiter’s office while a camouflage-wearing, big-muscled, tough-talking soldier insisted my 7-year-old son was ready to serve his country by enlisting in the military. Sam is actually 17 years old, entering his senior year in high school and considering joining the Army under the Delayed Entry Program, essentially meaning he signs the papers now but doesn’t report to boot camp until after high school graduation next June. This is my baby, my first-born son. How is it possible he is old enough to be thinking about the military? He’s supposed to be playing cowboys and Indians, not defending his country. You can read the full blog entry HERE. Lynn Nankervis originally wrote this for the Bloomingdale Patch. Her writing was so clear and insightful, I contacted Lynn for permission to re-use her column. She also writes The Brady Bunch Plus One blog.